Stephen Ohlman has over 20 years experience in the martial arts, specializing in Aikido and holding ranks in Karate-do and Judo. He began studying Judo in 1980. His first teacher focused on Judo as a form of Budo (Martial Art) and did not encourage sport competition. Later under the guidance of his second and third teachers he participated in the Ontario Junior Olympics and the Ontario Winter Games. 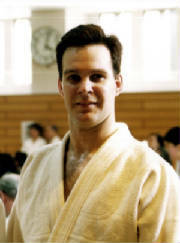 Although Stephen Sensei understands the value of competition to bring out the best in individual’s techniques, he is more interested in Aiki-Judo as a means of developing character as well as physical skill. Stephen Sensei now heads the Hiryukan Dojo in Barrie.